The crew does an incredible job of lowering these SAFE boats into the water with Kona coast in the background. Oh man, I am so happy that we’re underway! The swells found us today and we’re finally rocking around – it is great! Today, the game-plan is that at 6am the 15ft SAFE boat runs out into the sapphire blue Hawaiian waters to study the slicks (areas of converging down-welling currents- the glassy parts in the ocean) while the 19ft boat tries to find juvenile bottom-fish. Good luck! I, however, am helping three other scientists with trawling for billfish. 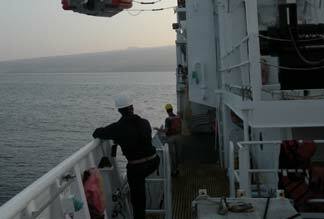 We’re working with the Isaacs-Kidd trawl (I/K). This is a 10 meter long net with 5mm mesh that is connected to a detachable cod-end which collects the plankton. The I/K was named after the researchers from Scripps in La Jolla who developed the technology in the 60’s. We dropped the net bearing their names into the water by an A-Frame winch maintaining just below the surface for an hour. At this time the net is retrieved and the cod end is removed for study. It is replaced with a fresh end and the net is thrown back into the water for another hour. 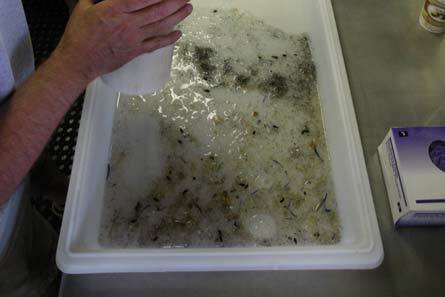 The cod-end is brought into the hydro-lab and the contents are splayed out into a tray and analyzed. The marine organisms are then sorted, organized and labeled for any rare or special fish – my personal favorite is the long, skinny Lizardfish in the middle of the tray. The different fish in this photo are really interesting. The small one in the top left is a Slender Mola which as an adult lives in the open water, the longer Lizardfish lives on the bottom, the Blenny lives near shore in shallow water while the Lantern-fish grows up, lives in mid-water and develops light organs. As adults they grow into different sizes, scatter into different waters in the ocean and adapt accordingly. But as larvae they are all found together—in the slicks. The target specimens for this trawl are Marlin, Swordfish and other billfish larvae. And you know what? We caught a couple; the one pictured is a baby Swordfish. From this photo it is hard to believe this creature grows up to be the extremely muscular fish in the same sub-Order as the one Hemingway writes about, but it is true. Not much is known about the life histories of these fish, that is why we’re here, but it is believed that it takes many years to reach adult. 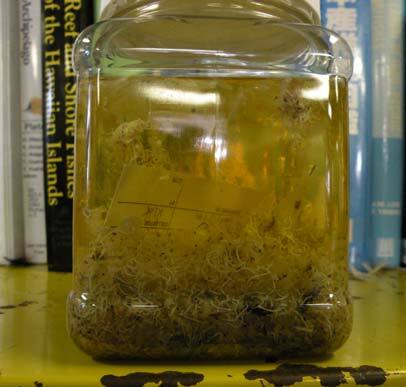 The specimen were photographed and then placed in a 32oz plastic jar with ethyl alcohol for further analyzing later. We repeated this process 6 times throughout the day. The I/K collects a lot of very small marine organisms. It looks like gumbo. Luckily, this isn’t our dinner; we’re fed a lot better looking— and definitely tasting— food on this cruise. We collected numerous jellies, shrimp, fish larvae, debris, eggs, nudibranchs and crabs. All of it is relatively transparent so you don’t notice it while in the ocean. The I/K concentrates the gelatinous biota and truly illustrates what is in the water. And considering the warmer waters of the tropics are less productive than colder waters, this isn’t everything that could be there. Just don’t think about this when you open your mouth underwater! The trawl was fun and definitely a new experience. It is truly incredible the amount of life that is in the water. Until you see you it pulled out, you don’t believe it. This is one of the paradigm-shifting results from being on this ship that I am only now beginning to realize. This entire vessel is designed to study the ocean; every facet of this boat is geared toward understanding the marine world. 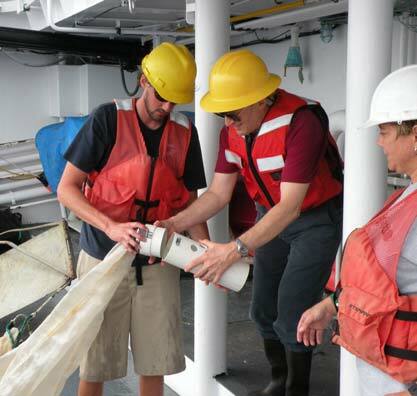 The researchers and crew on the Sette are actively embracing NOAA’s mission of stewardship. Why are the fish we catch the colors they are—orange, yellow, red, etc? This was one of the questions I asked some of the expert marine biologists over dinner the other day and I was told that one of the reasons is that the colors makes the fish invisible. Red absorbs the spectrum of light that gets down around 100 fathoms and makes the fish look grey. New words: Vog –volcanic fog. Here the marine layer is normal condensation coupled with volcanic particulates. Kai – Hawaiian for the sea; Nalu – Hawaiian for waves; Kuliana— Hawaiian for responsibility. This can be responsibility for anything: your job, your family, etc. But as Ensign Norris says, it is also responsibility for the environment and it reminds us to protect what we have. We saw a Laysan Albatross (Phoebastria immutabilis) today zooming the boat. It is a beautiful bird that I’ve never seen before and its wings were truly massive. 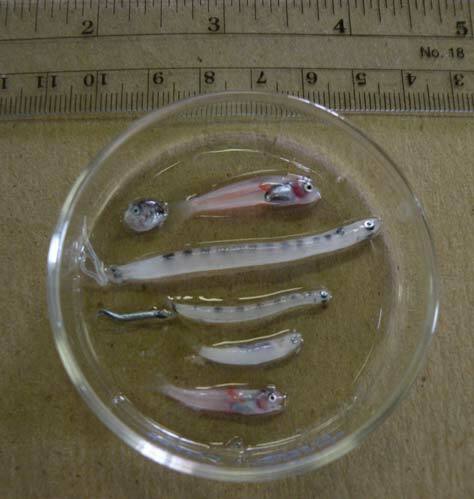 We also caught a few billfish and fish larvae so tiny they look like they are just heads! 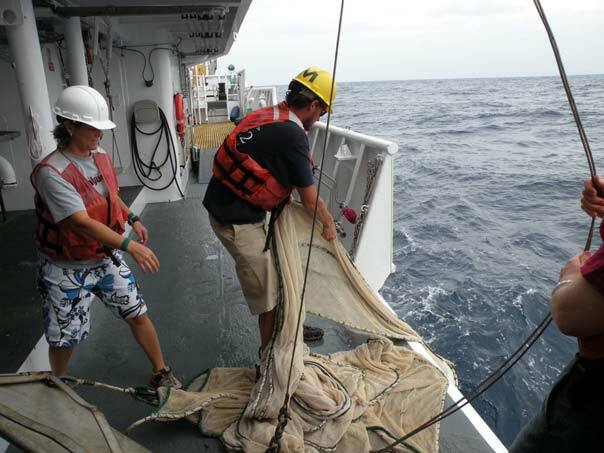 This entry was posted in 2009, NOAA Teacher at Sea, Taylor Parker and tagged Albatross, bottomfish survey, commercial fishing, Hawaii\, lizardfish, NOAA Ship Oscar Elton Sette, swordfish, volcanic fog, water slick. Bookmark the permalink.